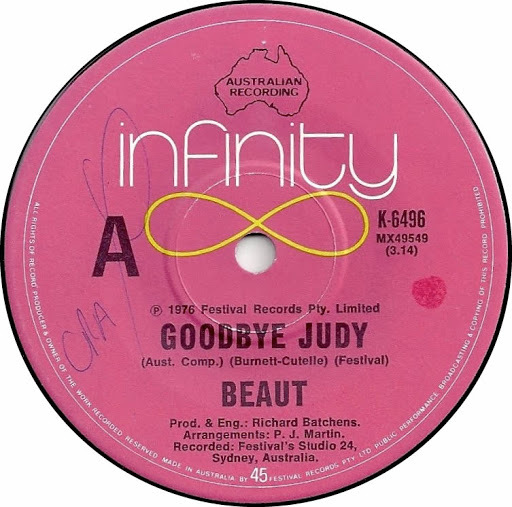 Song of the day: Beaut – "Goodbye Judy"
I’m afraid that today’s song involves skullduggery on my part. One of the songs there was something I’d never heard before. It’s “Goodbye Judy“, a power-poppy track by a band called Beaut. Side note: Before I go on with my tale of skullduggery, I just want to say that I think ‘Beaut’ is a ghastly name for a band. Absolutely ghastly. I listened to “Goodbye Judy”, enjoyed it, and thought “Hey, that’d suit my blog.” That’d be no problem, I reckoned. I’ll just contact Wallaby Beat and ask for permission to use their track on my blog. Easy. Unfortunately, I couldn’t find a way to contact Wallaby Beat anywhere on the blog. No email address, nothing. So, I’ve had to resort to filching the song and give thanks to whoever can’t be contacted on the Wallaby Beat blog. Thanks, Wallaby Beat – whoever you are! You are currently browsing the archives for the Beaut category.